Pleasant View Skilled Nursing & Rehab would like to welcome and share with you some of the rich history of this family owned establishment. Pleasant View Skilled Nursing & Rehab opened its doors to the area’s elderly in 1941 in Norton, Ohio. Under the personal care of Olive Allenbaugh (Morris), our grandmother, healthcare was provided to many residents of the community. In 1950, Olive passed on and her son, Ken Morris and wife Eileen (our parents), carried on the business while raising their seven children. Over the years, Pleasant View Skilled Nursing & Rehab has grown and expanded, but we have never lost sight of the goals that Olive set out for us and that is to provide the highest standard of care for the area’s elderly. As the third generation of our family, we feel a commitment to uphold the standard of excellence in personal care that our grandmother set out for us years ago and that our parents have modeled so wisely. We hope that we can be of service to you and your family. Pleasant View Skilled Nursing & Rehab is a 121-bed skilled nursing and rehabilitation facility located in Barberton, Ohio. Our center is committed to meeting the individualized needs required for each residents’ well-being. 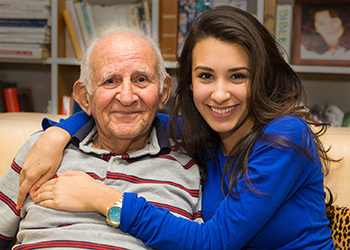 The social, emotional, and intellectual needs of our residents are met through our daily activities. A consulting dietician and full-time dietary manager aid in the preparation of nutritional, palatable, and attractive meals. Special dietary needs are met as necessary, and meals are served in a pleasantly warm and comfortable atmosphere. Pleasant Pointe Assisted Living provides a family atmosphere while accommodating your living needs and wishes with choices that keep your independence. Our 49-unit facility is connected to our skilled nursing facility. We offer spacious one-bedroom and studio apartments. We provide amenities to make your stay comfortable such as daily light housekeeping, weekly full housekeeping, fresh towels delivered daily, personal laundry weekly, three nutritious home-made meals, snacks, daily activities and assistance with medication and care. We invite you to visit our community today. Take a tour and view our beautifully renovated community and offered accommodations. You can learn more about services and activity programs by contacting us today. All skilled nursing beds are Medicare and Medicaid certified. The full in-house rehab unit provides: PT, OT, ST. Admissions can be processed 24/7.